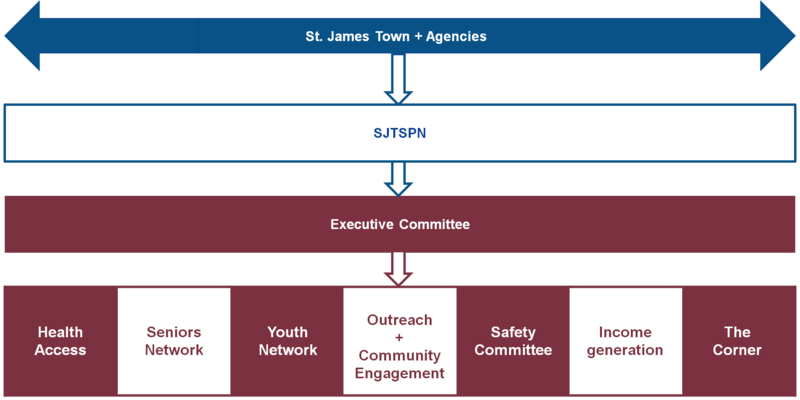 The St James Town Service Provider’s Network (SPN) is a network of agencies formed to bring a collaborative partnerships, community engagement and integrated service coordination approach to the community of St James Town. SPN promotes inclusive and equitable social and economic development initiatives which delivers employment and career opportunities, social enterprise, informal economic opportunities and population specific services. 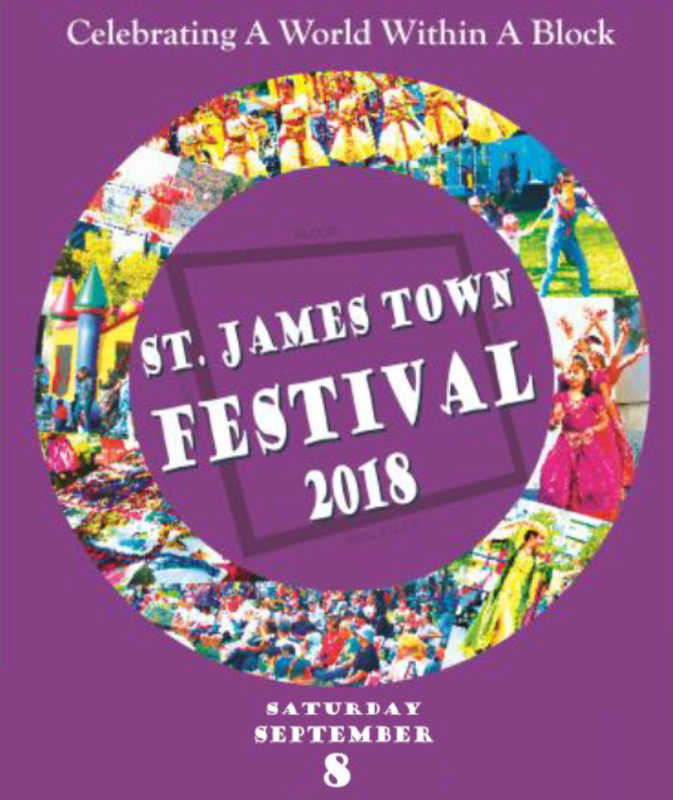 The St James Town Service Provider’s Network vision is to be a leader in service coordination, resident engagement and empowerment to achieve a sustainable, welcoming, vibrant and inclusive community. 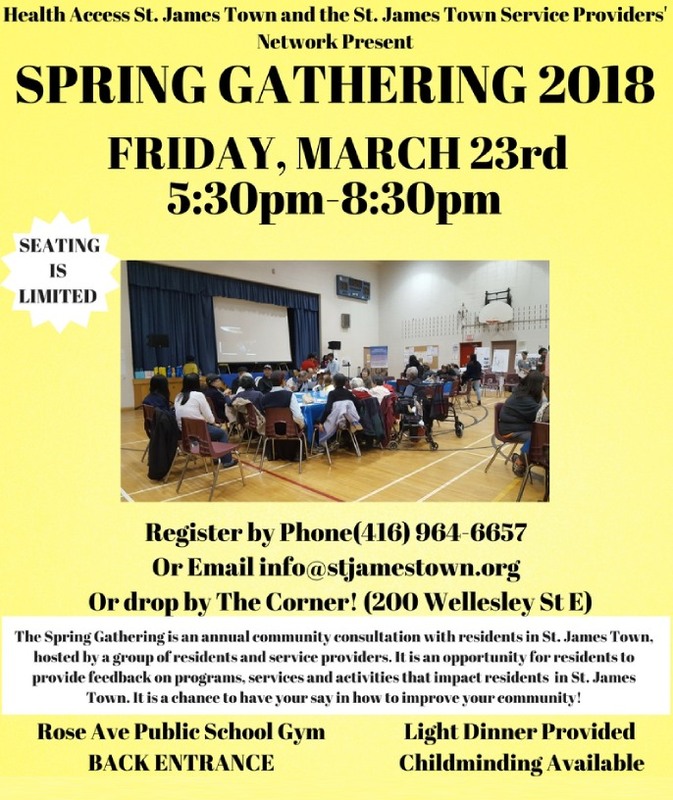 The St. James Town Service Providers’ Network collaborates and coordinates stakeholders inside and outside the network to address the needs of residents and promote an inclusive and vibrant community. 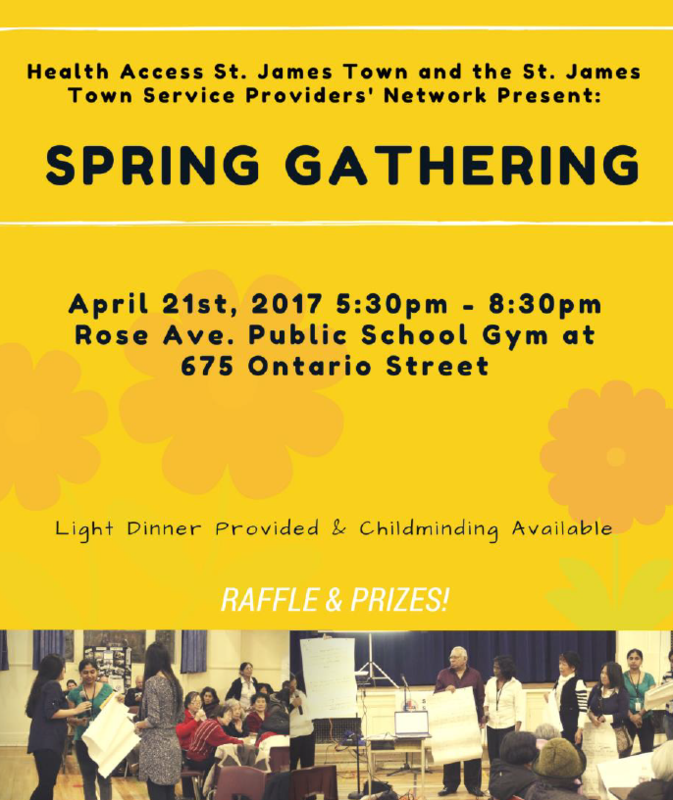 We the St James Town Service Provider’s Network bring together local residents, when possible, and community agencies in welcoming and collaborative spaces to promote community well-being. To do this we collaborate and organise events, coordinate services on solutions for emerging social justice, economic well-being and population specific initiatives. We are committed service coordination, integration and collaboration to achieve sustainable outcomes for a community built on trust, neighbourly care, equity and the diversity of our residents. 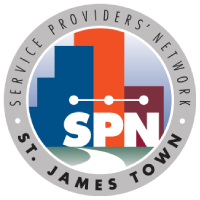 The St. James Town Service Providers’ Network (SJTSPN) consists of service providers and community members who work collaboratively to support the St James Town community. The Network leads the development and implementation of a coordinated plan for a vibrant, safe and healthy community. Identifying and addressing the needs, gaps, resources and trends related to Senior residents of the St. James Town community. Improving the safety, well-being and security of St. James Town by collaborating with residents, landlords, the City and law enforcement agencies. Collaborative endeavor using social connections to create a neighbourhood with increased opportunities for income generation. An attempt to collaborate and coordinate services to address the needs and create opportunities for youth between ages 12 – 29. Initiatives and forums that build trust and connections between residents and service providers, like the Festival and the Spring Gathering. Systematic strategic mediations to influence political, economic, and social decisions in line with the needs and interests of the community. A client-focused model which aims to connect unattached and disconnected residents to health and social services. A community hub with meeting spaces, program rooms and community kitchen dedicated to local initiatives and services. The Service Provider’s Network has 35 agencies and institutions as partners providing varied services at the Town. The municipal government of Toronto, known as the “City of Toronto”, is a public corporation which provides services, facilities, safety and infrastructure for communities also performs activities, all through agencies and corporations in Toronto. It was incorporated in 1834, and currently it is administered by 25 elected councilors who along with the mayor, make up the Toronto City Council. Pam McConnell (1946 – 2017) was a municipal politician in Ontario, Canada. She served on Metro Toronto Council from 1994 to 1998. She also served on Toronto City Council from 1998 for Ward 28 since its creation in 2000, and was re-elected every term until her death. McConnell is credited for her role in advocating poverty reduction and the revitalization of the Regent Park neighborhood. Employment, housing and Senior Services. Dixon Hall Neighborhood Services began as a soup kitchen in 1929, and since then has been steadily increasing and strengthening a diverse range of integrated services for residents of east downtown Toronto. Their main goal is to create lasting solutions to end poverty, social injustices and social isolation in Toronto. Elizabeth Fry Toronto established in 1952, provides programs and services, community support and transitional residence for women who are or have been at risk of being in conflict with the law. Considering women as the vulnerable part of the society, they recommend alternatives to the criminal justice system as well as educating society and public institutions about the challenges that those women might encounter. Fred Victor is a social service charitable organization established in 1894 that fosters long-lasting and effective changes in the lives of homeless and low-income people living across Toronto. Their programs and services are mainly focused on providing housing and shelters for people who live in extreme poverty, health care services and various training programs for those seeking sustainable jobs. Hospice Palliative Care Ontario (HPCO) is an organization which provides end-of-life palliative care to terminal patients by providing and advancing compassionate care and leadership in the volunteer-based community. It is the result of merging of the Hospice Association of Ontario (HOA) and the Ontario Palliative Care Association (OPCA) in 2011. It is one of twelve primary care practitioner units participating in the development of advance care planning in Canada. A social enterprise co-op established in 2015 to bring together organizations and individuals who can assist and support the development of projects and enterprises initiated by and for residents of St James Town neighborhood. Their main goal includes income security, food security, social exclusion and isolation which ultimately will contribute to long-term strategies for sustainable economic opportunities in Toronto. Medallion Corporation is a privately owned, Toronto based, fully integrated real estate development and property management company founded in 1997. Their projects include residential subdivisions and multi-family apartment communities in the GTA. Medallion’s portfolio is comprised of a full spectrum of real estate holdings, from high rise residential buildings to commercial office, retail and industrial properties. Monsignor Fraser College is a Roman Catholic Adult High School, founded in 1975 and run by the Toronto Catholic District School Board in Toronto, Ontario, with six campuses and various programs. It provides an alternative to the traditional school setting for high school students and for adults new to Canada with the aim of empowering students to their full potential. A community-based organization dedicated to provide resources and support to urban Indigenous women and their families. NWRCT delivers culturally relevant programs and services that empower and build the collective capacity and self-sufficiency of Indigenous women. The NWRCT is founded in 1985 and it is a registered charity funded by government programs as well as public and private donations. Glen R. Murray (born 1957) is a Canadian politician and urban issues advocate. He served as the 41st Mayor of Winnipeg, Manitoba from 1998 to 2004. He subsequently moved to Toronto, Ontario, and was elected to the Legislative Assembly of Ontario as a Liberal Member of Provincial Parliament (MPP) for Toronto Centrein 2010, serving until 2017. He also was appointed to the provincial cabinet as Minister of Research and Innovation in 2010. Our Lady of Lourdes School is a public high school founded in 1910 and located in Sherbourne, Toronto, Ontario. It is a part of Toronto Catholic District School Board. Literacy and numeracy skills as well as faith development are their central focus throughout the curriculum in order to have caring and creative citizens. Progress Place is a mental health and wellness organization which first opened as a part-time drop-in centre in North York (1976). Since 1983, by launching a supported housing program, as well as a transitional employment program it has been providing part-time supported employment to people with severe and persistent mental illness such as Schizophrenia, Bipolar, Depression and Anxiety. Rose Avenue Junior Public School – TDSB is a public elementary and high school located in the most densely populated and multicultural communities in North America, the centre of St. James Town, Toronto, Ontario. It was founded in 1884 and currently it has a student population of over 650. More than 85% of the students have English as their second language, representing about 50 language groups. A non-profit community organization founded in 2002, providing accessible and effective primary health care to the people who may have been under-served by conventional health in southeast Toronto such as homeless/under-housed, LGBTQ and newcomers. They offer counseling, health promotion, outreach, advocacy, education, research and development, peer support groups and arts-based programming. The SickKids Centre for Community Mental Health (SickKids CCMH), formerly known as The Hincks-Dellcrest Centre, founded in 1998 in Toronto, is a community of the University of Toronto’s Faculty of Medicine (Department of Psychiatry) and Factor-Inwentash Faculty of Social Work. It helps 6,000 children and families each year through a combination of prevention, treatment, research and education activities. Social Development, Finance & Administration provides financial and support to the Deputy City Manager, citizens and City Council in order to foster safe and strong neighborhoods and communities, improve community engagement, provide advance life skill opportunities for youth, etc. Generally, its goal is to develop and deliver integrated services that can provide community social needs. A Catholic teaching and research hospital founded by the Sisters of St. Joseph in 1892 to care for the sick and poor of Toronto's inner city. The Department of Family and Community Medicine at St. Michael’s Hospital is a large dynamic and diverse unit comprised of the hospital itself and six affiliated family medicine clinics, all located in Toronto’s downtown core. A non-profit organization providing social, recreational and health promotion day programs for seniors in the Greater Toronto Area. Since 1970, it has been working with seniors from all walks of life including seniors from newcomer communities, seniors with disabilities, and seniors from all ethnic communities, religions, cultures, racialized communities, gender identities, and sexual orientations. A public housing agency founded in 2002, funded by Toronto and the Government of Ontario. It is the second-largest housing provider in North America with over 58,000 units of housing and an estimated 164,000 tenants. The agency owns more than 2200 buildings including high, mid, and low-rise apartments, townhomes and houses. It is an agency of the City of Toronto. Toronto District School Board is the English-language public-secular school board founded in 1998 in Toronto, Ontario, Canada. The TDSB is Canada's largest school board and the fourth largest school board in North America. They serve approximately 246,000 students in 582 schools throughout Toronto, and more than 140,000 life-long learners in Adult and Continuing Education programs. 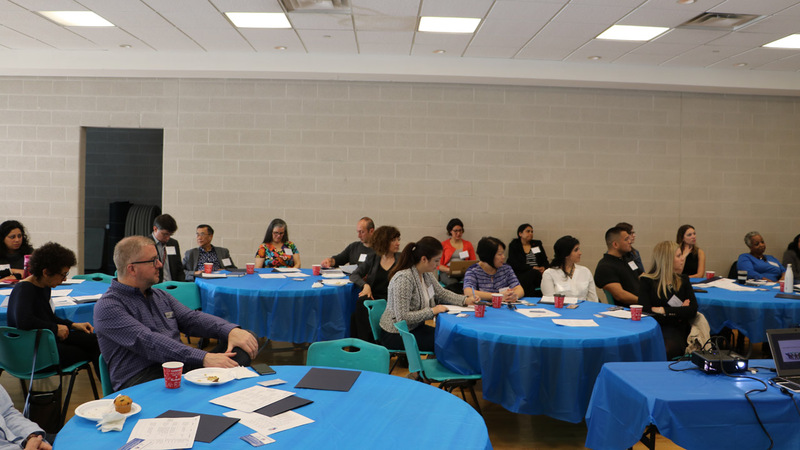 Formerly known as Thorncliffe Neighborhood Office, is a community based multicultural, multi-service agency providing community-based services to residents of Thorncliffe Park and surrounding communities in Toronto. It is founded in 1985 and its main goal is to build safe and healthy communities through supporting and strengthening the quality of individual and community life in the areas they serve. A Christian nonprofit organization that has been the oldest and longest running outreach to people living in poverty in Toronto, Ontario. The organization serves families in six communities: Jane-Finch, Flemingdon-Park, St. James Town, Kingston-Galloway, Victoria Village, and Willowtree. It was established in1879 and theit main focus is to transform lives of families who impacted by poverty. 51 Division Toronto Police Service is located in 51 Parliament St., Downtown, Toronto. Serving in the most challenging area in Toronto, 51 Division holds a vital position to create a safe area for the neighborhood. Their main goal is to build trust and strengthen community partnerships, understanding the local environment and identify, prioritize and reduce crime and disorder. Turning Point Youth Services is an accredited, non-profit multi-service agency, founded in 1976, and located in Wellesley Street East, Toronto, Ontario. It serves youth ages 12 to 24 and their families through 3 main ways: counselling, providing residential care and treatment (including emergency shelter) and support if someone is in trouble with the law. A not-for-profit, volunteer-based organization with members from diverse backgrounds, including: business leaders, marketing professionals, local and international development experts, community economic development leaders. They support low-income people to become economically empowered through the establishment of new community based initiatives aimed at income generation and economic opportunities. UforChange is an organization, founded in 2009, which provides young people, ages 16-29, with a combination of creative, practical and soft skills that will help them develop career paths as well as a supportive and collaborative environment. They achieve this through their Core Arts program, which offers Fashion, Photography, DJ and Film to 50 young people every year. Wellesley Community Centre is a priority centre at Sherbourne Street and Wellesley Avenue in the St. Jamestown Community. They offer various programs, namely Arts & Dance, Fitness and Exercise, Sport programs, Cooking Classes, etc. for preschoolers, children, youth, adults and older adults. They also offer various camps for children during the winter, March and summer breaks. Winchester Junior and Senior Public School is founded in 1874 and since then it has been serving the students of the Cabbagetown and St. James Town neighbourhoods. The diverse student population represents over 40 countries and languages. It has active partnerships with neighbourhood organizations and schools, including Cabbagetown Youth Centre, Kiwanis Club, Central Neighbourhood House, Right to Play, Big Brothers and Sisters and Green Thumbs Growing Kids. A Community Health Centre, founded in 1987, for racialized women living in Toronto and surrounding municipalities. The main focus of their health care team is on health and wellness of women who face racism and inequality by prioritizing those from African, Caribbean, Latin American and South Asian communities. Their services are fully accessible and designed to address the barriers that prevent women from being in excellent health. Founded in 1937, it is one of the largest social service agencies in Toronto. 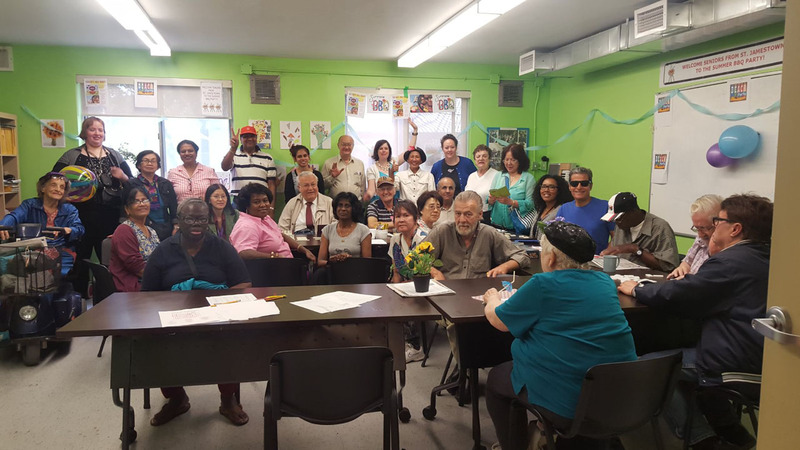 WoodGreen offers more than 75 innovative programs to some of Toronto’s most marginalized communities, such as, seniors to live independently, parents to access childcare, children and youth to access after-school programs, newcomers to settle in to Canadian life, etc. A non-profit, charitable community agency established in 1969 in Toronto. It is funded by the Ministry of Children and Youth Services and the Ministry of Health and Long-Term Care. They serve all children and families, regardless of race, creed, ethnic origin or financial circumstances. Youthdale's clinical services include outpatient consultation, residential treatment, and psychiatric crisis response. YMCA of Greater Toronto is a charity organization. Founded in 1844, its main goal is to offer children, teens, young adults and families the opportunity for personal growth, community involvement and leadership. Through child care services, education and training programs, employment and immigrant services, family and youth services and health and fitness programs, the YMCA is building healthy communities across the GTA. Canada’s first youth employment organization. It is a nonprofit organization which is founded by The Rotary Club of Toronto in 1968. YES leads the Canadian youth sector with innovative programs that empower disadvantaged and vulnerable youth to become self-sufficient contributing members of society. They provide young people with professional counseling and training to help them realize their full potential. Business Improvement Area (BIA) is a geographic area in a municipality. It is an organization to provide certain business promotion within that area. A BIA allows local business people and property owners to join together and with the support of the municipality, promote economic development in their district. The local municipality is the body that is responsible for approving the budget of the BIA.